Johnny Marr and Noel Gallagher took in a Manchester City game at Etihad Stadium yesterday. Fans watching the game on tv were treated to a few quick shots of the legends - check out a couple of screen grabs from the game below. 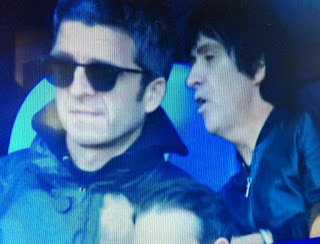 Marr and Gallagher have collaborated and performed together many times over the years and it's truly a treat to see them hanging out together having fun.